You can send emails to the agent or guest directly from the booking. Use this to confirm the stay. It's also great way to inform them about your cancellation policy, or any events coming up around their booking. 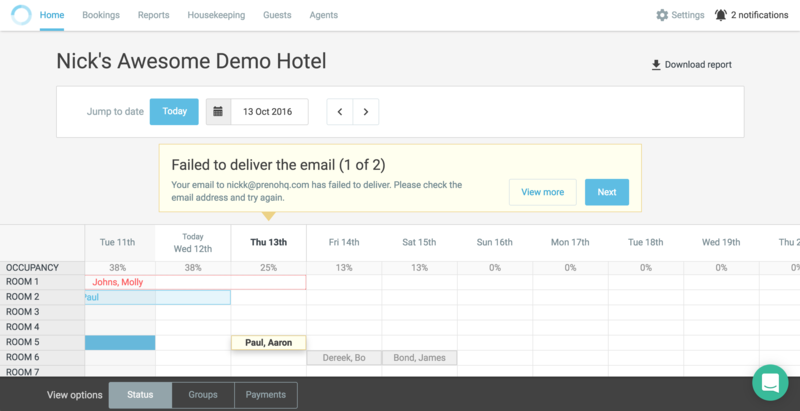 Rather than manually typing out the email, Preno can automatically fill in booking information using an email template. Preno can tell you what stage it's at with delivering your emails - if they're in the queue, successfully delivered, or if they have bounced back. Once you've sent an email, a new section of the booking page will appear called Emails. Under the Delivery status column, you can see whether the email is Delivering, Delivered, or Failed. If an email delivery has failed (bounced), you can view the e-mail that you sent off, and review whether or not you entered in the correct email address. Preno will try a few times to send the email if it bounces back. After a few failed attempts, you'll receive a notification about the failure to send and a notification on the grid about it.